If you like ginger and if you like chocolate this is the perfect recipe for you! These Ginger-Jazzed Brownies, chosen for this week's TWD by Hindy of Bubie’s Little Baker are not very fudgy, but a bit more soft than really cake-like brownies. For my taste preferences, they could have been even a bit more moisty. And even a bit more ginger-y. I am a ginger-lover since some years now, therefore I was very much looking forward to this recipe, and didn't get dissappointed. I dressed them up a bit with a chocolate glaze and some chopped candied ginger. I wonder if you could swap the corn syrup for honey and the chocolate glaze for lemon glaze as both are usually a good flavour combo with ginger. Next time, I'll try these changes! For the recipe turn to Hindie's page or have a look into Dorie's book on p. 101. Wow, those are so pretty with that ginger arranged like artwork on the top! Some people are just so creative (that would not be me, of course). Very nice. Love the frosting and candied ginger on top! 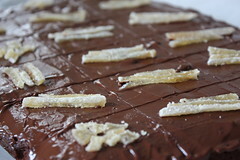 mm the candied ginger looks great atop that ganache :) i'm glad you liked them. Great move on the candied ginger. I really loved these. I love the candied ginger strips on top. Great way to add a little extra ginger oomph!